You know what my most favourite thing about travel is, it reminds of me of my home. Doesn’t it happen with you as well? For instance, you visit some distant city and something about it, the cobbled streets, the aroma of a restaurant that fills the air with a delicious wave or a bylane that resembles the one leading up to your home or a simple glance and smile from a complete stranger, remind you of your home? Knowingly or unknowingly we all tend to look for something familiar, something like home wherever we go. I don’t really know if they have a word for this feeling but it truly does exist. I have grown up in a beautiful Himalayan city called Gangtok and the truth be told, most of the Hill stations in India are somewhat alike. Probably it is the geography of various Himalayan ranges, the people, their culture, the language and the food somehow seem to resemble a lot with each other. So having grown up in the hills of Sikkim, whenever I visited the hills of Himachal Pradesh, I was and will always be profoundly reminded of my hometown. Through the streets of McLeod Ganj looking for some more food. Such was an evening in McLeodganj in Himachal Pradesh, the winter of 2017. It was the long weekend of Christmas when I escaped the chills of Punjab to enjoy the wintery nights of Mcleodganj. Now, Dharamsala and the adjoining areas of McLeodganj have become popular as Tibetan settlements. 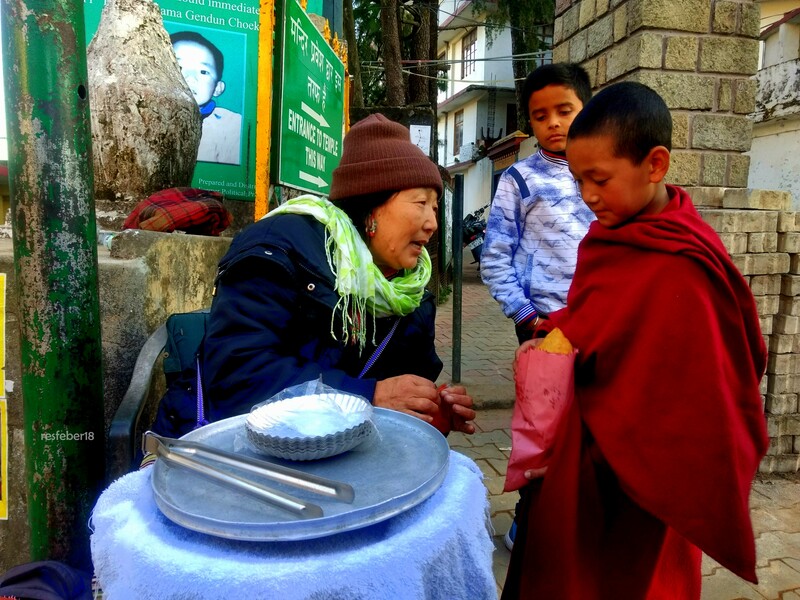 Sikkim has a large chunk of Tibetan nationals who have settled and blended so well into the cultures that the coexistence has greatly influenced the people of the hills. Despite visiting this scenic little hamlet for the first time it felt like home. 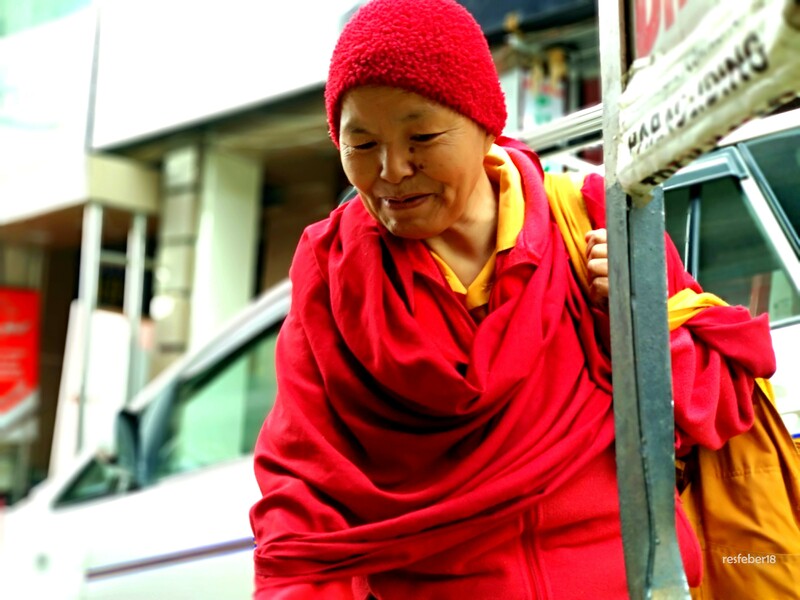 Whether it be the streets , the aroma of momos wafting in the air, or women walking around clad in Bakkhus (traditional Tibetan dress for the women) or the maroon and yellow clad Buddhist monks, everything about McLeodganj was so home-like. 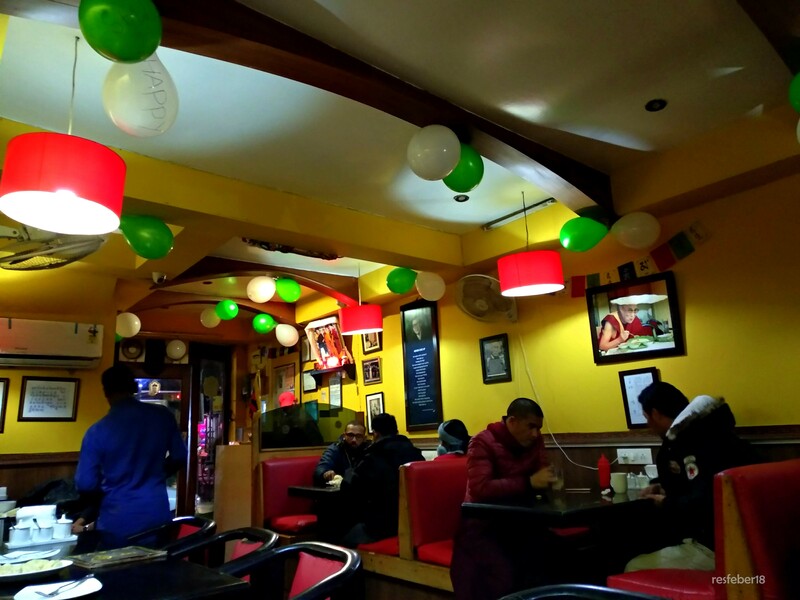 Amidst all of this and the cold winter chill, I and my friend discovered this cosy little restaurant called Tibet Kitchen. Since I was familiar with Tibetan food, she left the entire menu deciding exercise on me and I happily obliged. I was travelling with a vegetarian so my choices had to be on the safer side. I didn’t want her to not like Tibetan food for the rest of her life. But before we delve deeper into our food choices for that evening, I would like to tell you a bit about Tibet Kitchen. It is run by a gentleman named Mr Thupten Dorje. The restaurant is pretty easy to locate on the Jogiwara Road, it is the first restaurant on the left side. 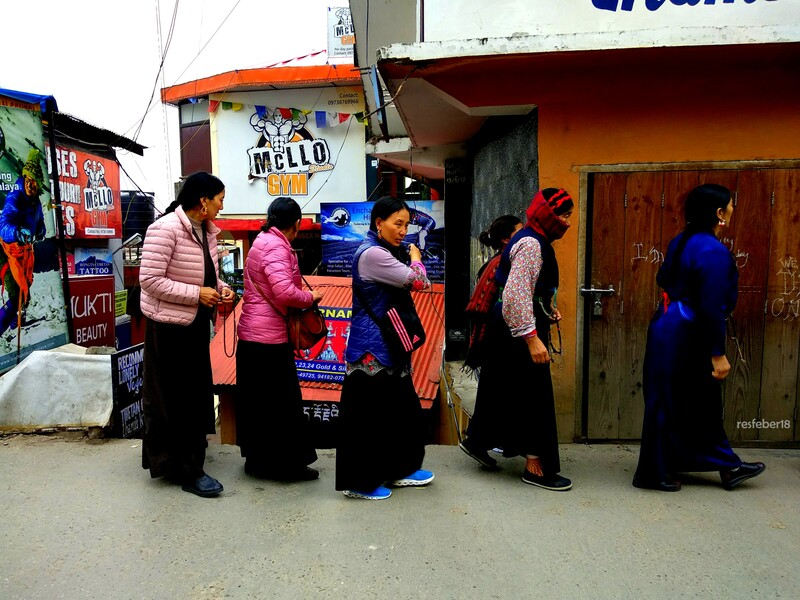 If you are standing at the culmination of all four roads at the city centre of Mc LeodGanj and if you are facing the famous Mc Leo restaurant then take the narrow Jogiwara Road on your left and you will inadvertently find Tibet Kitchen on your left. Upon entrance, I discovered this cosy and warm little restaurant filled with a delectable aroma that reminded me of my days in Gangtok. The walls are adorned with beautiful pictures of Dalai Lama and his quotes. The Buddhist prayer flags hung on the yellow walls emanate such a warm and homelike feeling. The staff is friendly and the music that plays just adds to the whole mountain vibe. 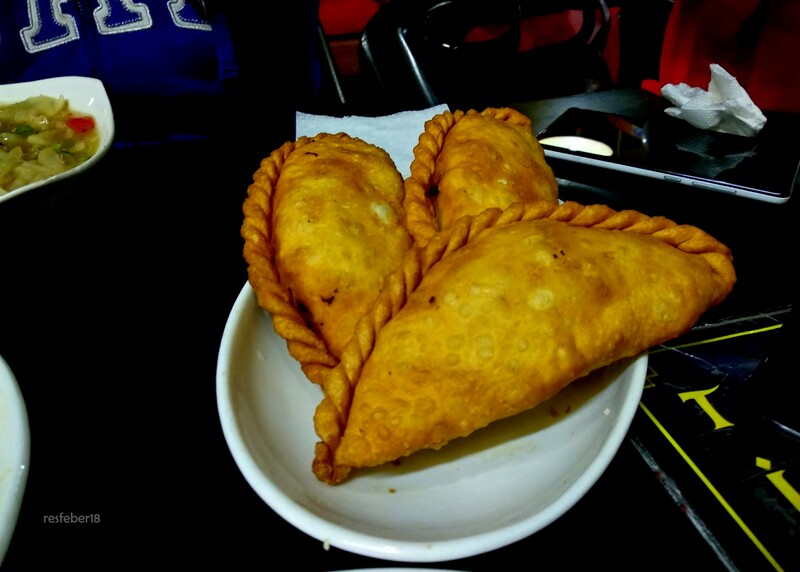 So for starters, I ordered a plate of Vegetarian Phaley which is a deep-fried stuffed pocket or calzone kind of a thing. The stuffing included finely grated cabbage, carrots and cheese. The cheese gave the added kick to the taste as these fine flavours melted in the mouth. Phaleys can be made with a number of fillings. There are meat variants of Phaleys which are equally delectable, for example, the Sha Phaley is a Phaley that is stuffed with a minced beef and cabbage filling. Phaley-The Show Stopper of sorts. 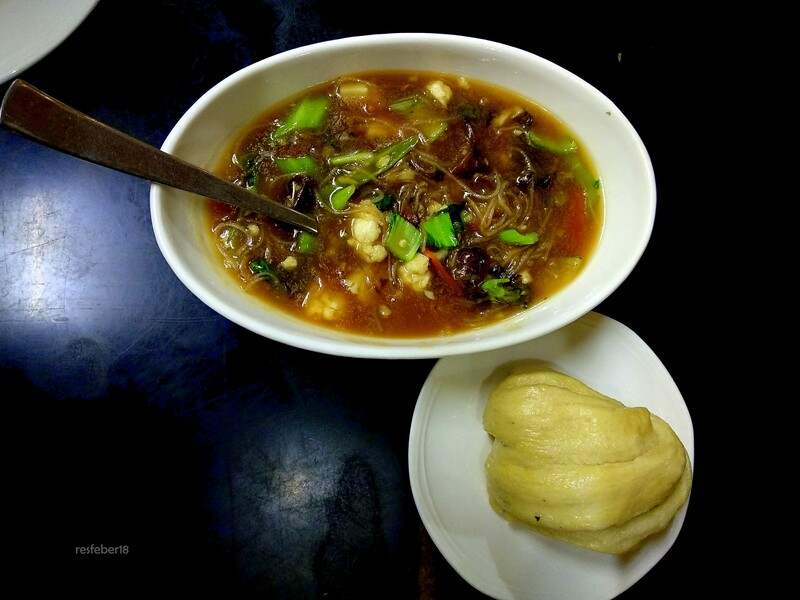 Then for the main course, I ordered the Tingmo or the T-momo as we call it in Sikkim. The other brother of Momos, Tingmo is a steamed variety of bread that is made from kneading the flour with yeast, baking powder and salt. The dough is left to rise for a while and then shaped in various kinds of shapes and steamed. To accompany Tingmo we ordered a bowl full of Tibetan style exotic vegetables topped with rice noodles called Phing or Phingsa. Generally, Phingsa is used to garnish the meat dishes and these add an extra zing to the whole flavour. 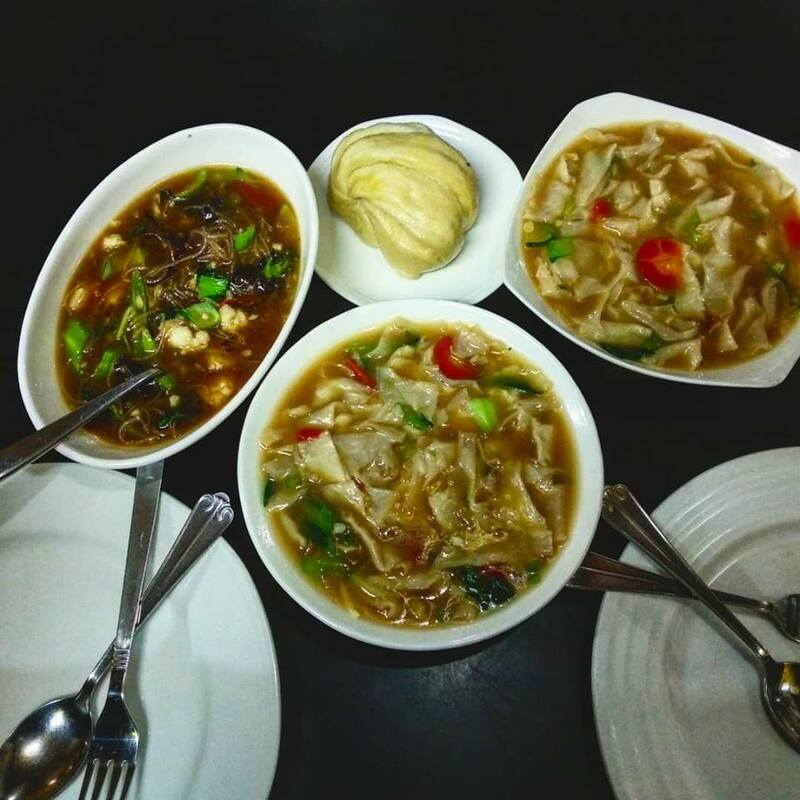 Apart from these we also went for a bowlful of Thentuk or the Tibetan noodle soup that resembles Thukpa to a great extent in taste and texture but is made with square shaped flat noodles. Thukpa, on the other hand, is a noodle soup made with long noodle strands. 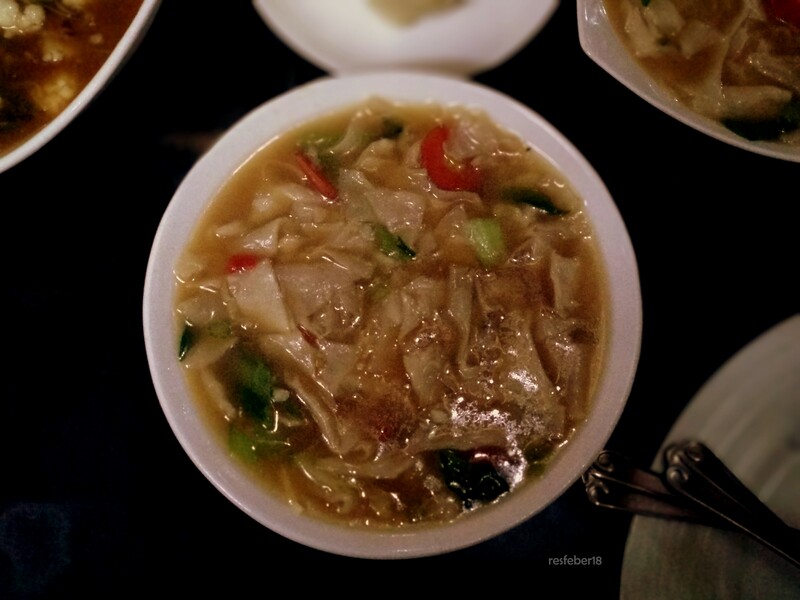 On a chilly winter night, Thentuk is the comfort food to go to. Apart from these roughly square-shaped noodles a lot of veggies also go into the Thentuk making it a very fulfilling wholesome meal in itself. 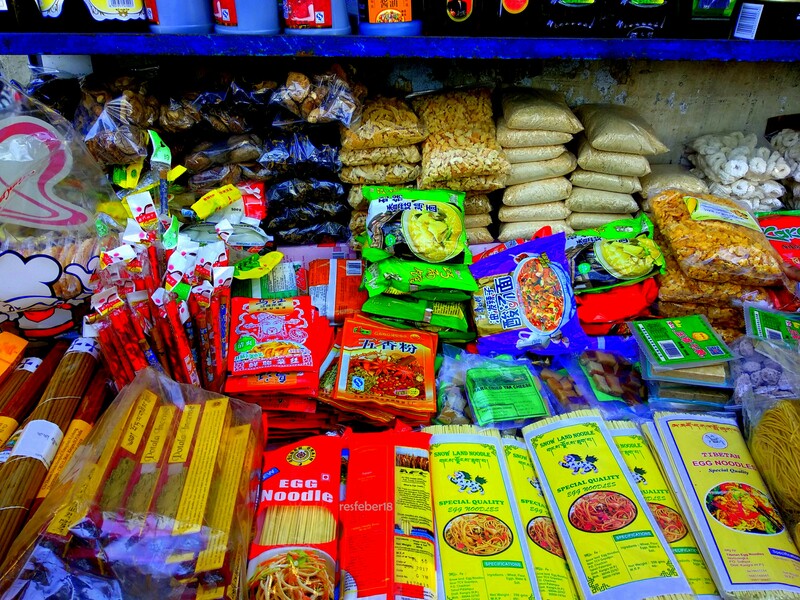 Food is integral to travel and what can be better than indulging in the local delicacies to experience a place better. We skipped the desert at Tibet Kitchen and decided to walk along the Jogiwara road. To our utter delight, we found this modest looking Tibetan Bakery the name of which I simply can’t recall. There we ordered a Yak Cheese Slice, this might sound exotic to others, but I have eaten Yak milk cheese or Chhurpi all my childhood. 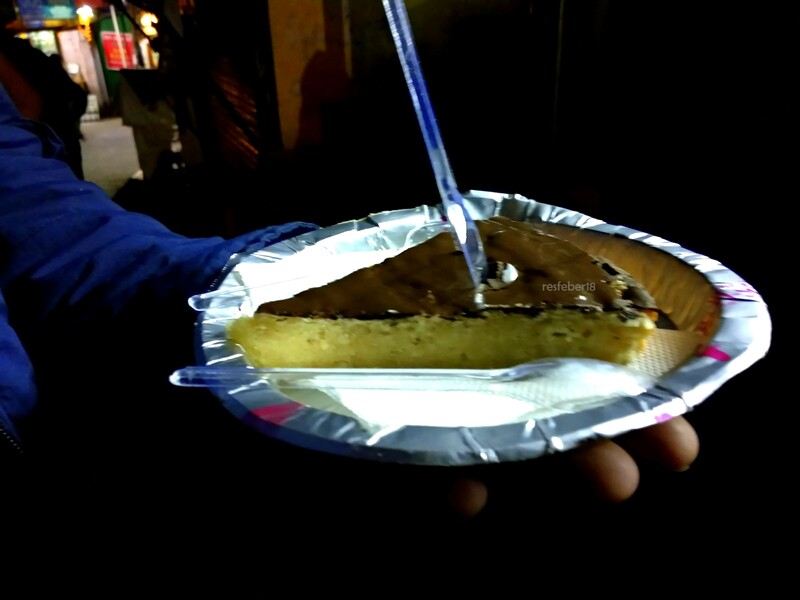 This crumbly cake-like bit was so delicious; it melted right into the mouth emanating mixed flavours of milk, coconut and sugar. With that, the desert was done right! Want to know more about Chhurpi? You may like reading Chhurpi-The Lesser Known Himalayan Cheese. The next few days in Mc Leodganj comprised of revelling in the winter sunshine and hunting for more good food. I don’t know why but I had remained completely oblivious of momos stuffed with boiled potatoes despite growing up in the hills. I ate them for the first time on our way to the Bhagsu falls. A humble Nepali lady sells these amazing vegetarian momos in her makeshift stall by the roadside. These are little balls of heaven when combined with the fiery chutney she serves them with. 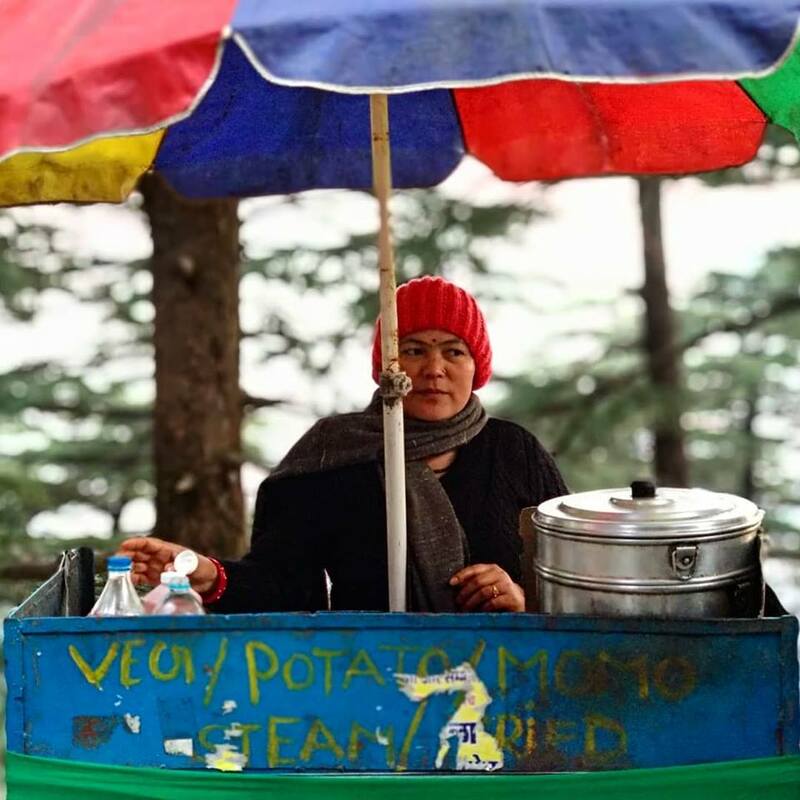 Also, just outside the Tibet Kitchen, you will find a Tibetan lady selling pan-fried momos and I strongly recommend you try her momos. These are a class apart. Loitering around the streets of Mc Leodganj we reached the Theckchen Choeling Temple or the Dalai Lama Temple Complex. Just outside the monastery gates there is this ever smiling lady who sells amazing Aloo Phaley or Phaley stuffed with boiled potatoes with fiery red chilly chutney just for Rs 15. The Phaley is soft unlike the crispy ones we had at Tibet Kitchen but it’s the chutney that slays this Phaley for sure. Greet her with a smile and enjoy these mouth-watering bits of paradise. 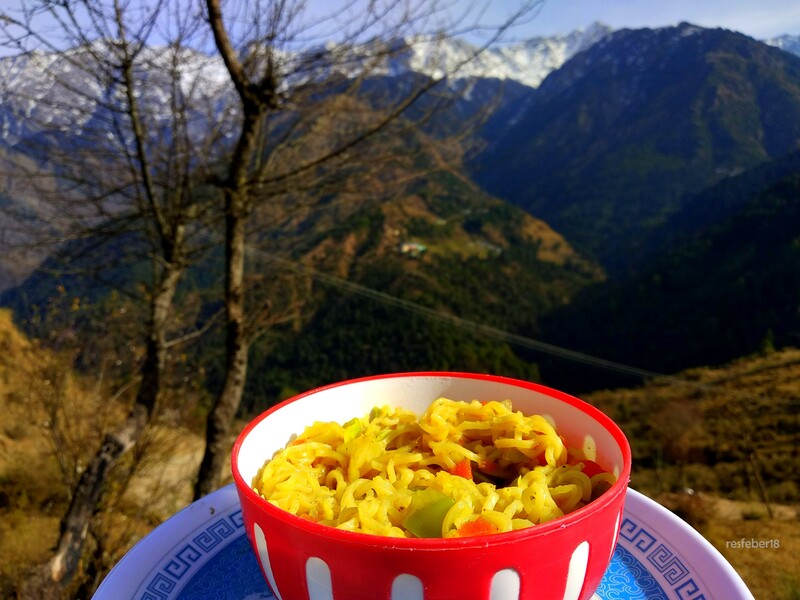 With that I thought I ended my food trail in Mcleodganj but how can a visit to the mountains be complete without slurping Maggi at a hilltop. 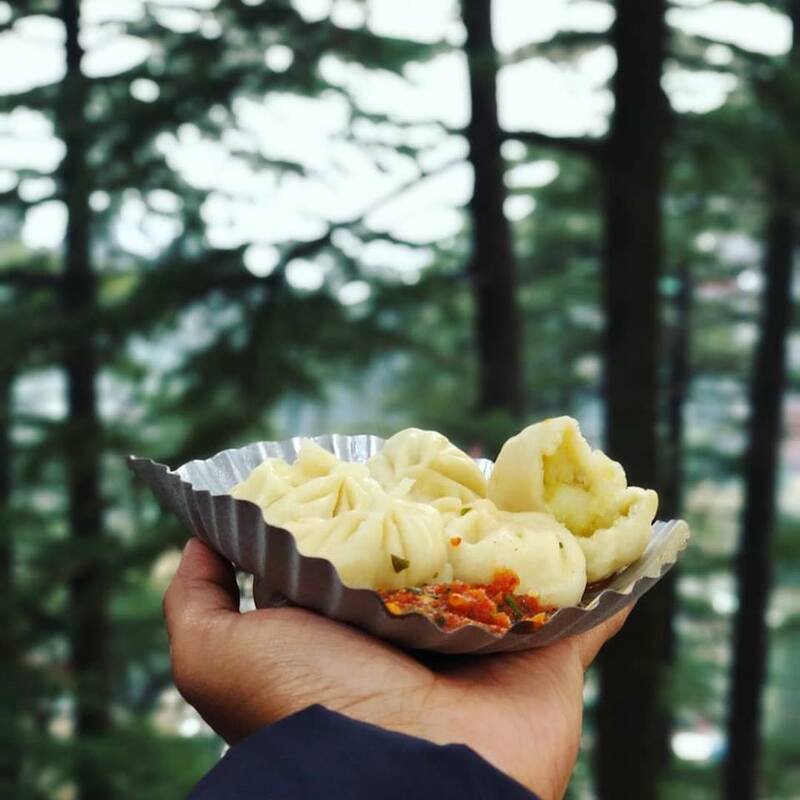 It may sound clichéd but when you visit Naddi near McLeodganj find a place to watch the mountains and happily gobble a bowlful of Maggi noodles. Trust me this is what pure happiness is made of. What are some of the most iconic food you have eaten during your travels? Do some of these items still make you drool when you think about those times? Let me know in the comments below until then keep travelling and keep eating your way through life! 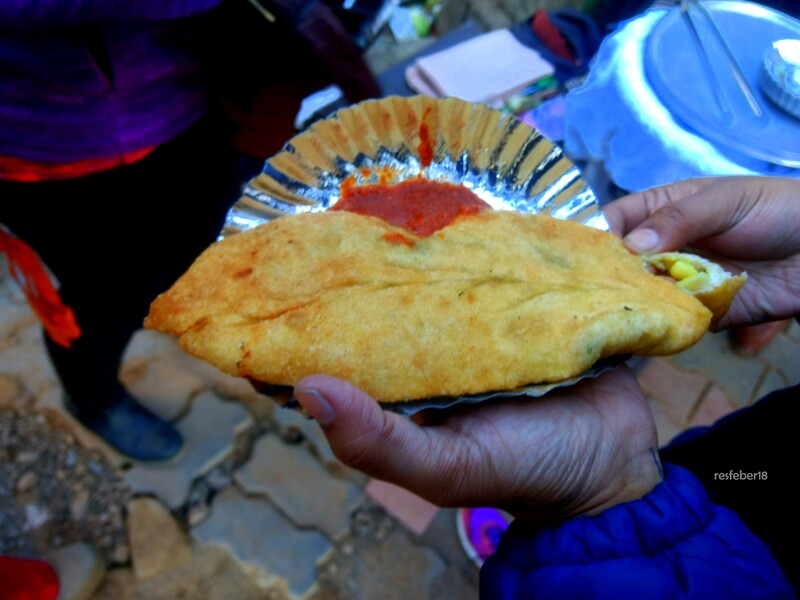 Chhurpi- The lesser known Himalayan cheese. Ten Reasons Why Sikkim should be your Next Destination. Darjeeling – On a clichéd touristy trail.